Original Rich Day Moisturiser is is the third level in the Vitamin STEP-UP SYSTEM™ and contains a high concentration of vitamin A which is an essential skin nutrient, as well as vitamins C and E and a combination of antioxidants that assist in combating the harmful effects of free radicals. This moisturising day cream assists in nourishing skin and in improving the appearance of uneven skin tone and sun damage, leaving skin looking radiantly healthy and beautiful. Contains the signature Environ complex of vitamins A, C and E and antioxidants that help to combat harmful free radicals and improve skin’s overall appearance. Regular use assists in softening the appearance of fine lines, in improving uneven skin tone and in repairing sun-damaged skin. Use only once skin is comfortable with Original Mild Day moisturiser. 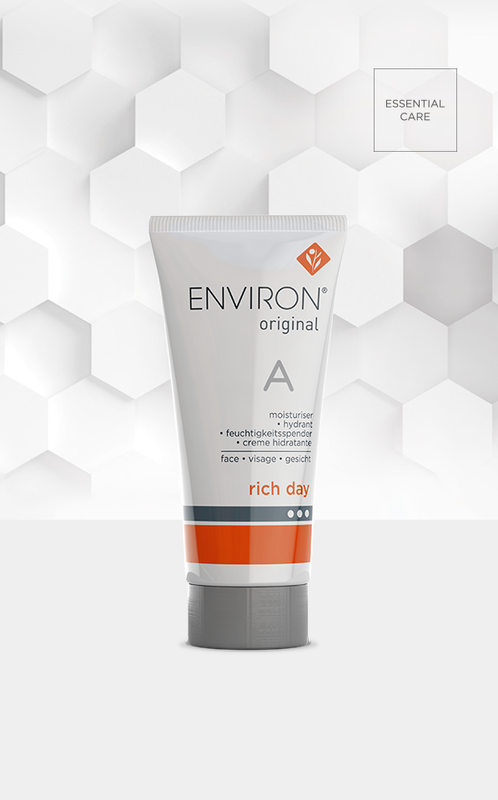 After pre-cleansing, cleansing and toning with your preferred Environ products, apply Original Rich Day Moisturiser to the face, neck and décolleté in the morning. Use a minimum of 2 tubes before progressing to the next level of the Vitamin STEP-UP SYSTEM™. Combat dry skin by applying Super Moisturiser+ over Original Rich Day Moisturiser. This oil-free make-up remover, containing honeybush extract and pro-vitamin B5, gently removes eye make-up without drying the skin around your eyes. A gentle pre-cleansing oil containing botanical extracts and vitamin E which assists in dissolving excess surface oil and leaves your skin feeling hydrated and silky to the touch. The creamy micro-exfoliating clay masque assists in absorbing excess oil so that your skin feels smoother and looks more radiant. A cream cleanser that gently removes excess oil, make-up and other impurities, leaving your skin feeling cleansed, refreshed and more radiant in appearance. A rich, foaming gel cleanser that gently removes excess oil, make-up and other impurities, leaving your skin feeling cleansed, refreshed and more radiant in appearance. This gentle, mild fruit acid toner assists in restoring the natural pH of your skin and refining its texture. This vita-peptide enriched gel assists in firming the delicate skin around your eyes and in softening the appearance of fine lines. Step-Up Level 1: A soothing, vitamin-enriched, water-based gel containing a low concentration of vitamins A, C and E and a variety of antioxidants that provide your skin with the essential nutrients it needs to look healthy and stay beautiful. Step-Up Level 1: This light moisturising cream contains a low concentration of Vitamins A, C and E and a variety of antioxidants that provide your skin with the essential nutrients it needs to look healthy and stay beautiful. Step-Up Level 2: This moisturising day cream contains a medium concentration of vitamins A, C & E and a variety of antioxidants that provide your skin with the essential nutrients it needs to look healthy and stay beautiful. Step-Up Level 2: This moisturising night cream contains a medium concentration of vitamins A, C and E and a variety of antioxidants that provide your skin with the essential nutrients it needs to look healthy and stay beautiful. Step-Up Level 3: This moisturising cream contains a high concentration of vitamins A, C and E and a variety of antioxidants that provide your skin with the essential nutrients it needs to look healthy and stay beautiful. Step-Up Level 3: This emollient-enriched moisturising cream contains a high concentration of vitamins A, C and E and a variety of antioxidants that provide your skin with the essential nutrients it needs to look healthy and stay beautiful. Step-Up Level 4: This moisturising cream contains the highest concentration of vitamins A, C and E and a variety of antioxidants that provide your skin with the essential nutrients it needs to look healthy and stay beautiful.